Southern Steel depicts the slashing fury of a Confederate sabre charge. The Southern horsemen, both from desire as well as necessity, traveled light; weapons, clothing and equipments were generally limited to the basic essentials necessary to do the job. This trooper is armed with a captured Federal sabre and a "brace" of Colt's revolvers, weapons ideally suited for the close-in fighting so highly preferred by the Southern Cavalry. His high boots, rare and highly prized, provide the protection needed for rough riding. His horse equipments consist of the barest essentials; a light-weight Jenifer saddle, one saddle blanket and a bed blanket strapped to the pommel. His jacket is tied on the back to allow him freedom for serious fighting. The bridle is captured Federal, modified to take a brass bit of Southern manufacture. A neck rope replaces a more cumbersome halter. 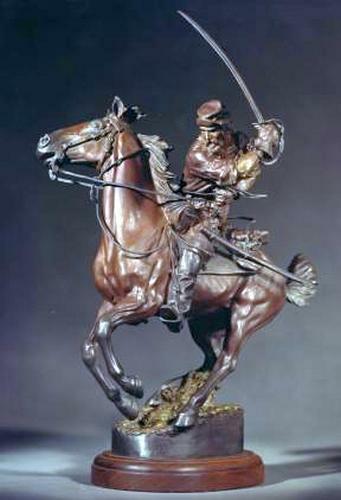 A background of riding and shooting combined with the fierce determination brought out by a grim war fought on their native soil, made the Southern Cavalry one of the finest the world has ever known. All equipments and accoutrements are modeled from originals in my personal collection.